On the evening of 13th December the temperature was dropping fast and moisture level was above 95%. It was time to go. And what an evening it turned out to be! Very good crystal material created amazing halos in the beam of a portable light or car headlight. A crystal swarm lasted typically less than 15-30 minutes at a given location and then the search for another good spot started. Later in the night I was able to enjoy a display for maybe an hour at a completely dark field. During that time I had time to lay on my back (while the camera exposure was ongoing) and absorb the amazing sight. 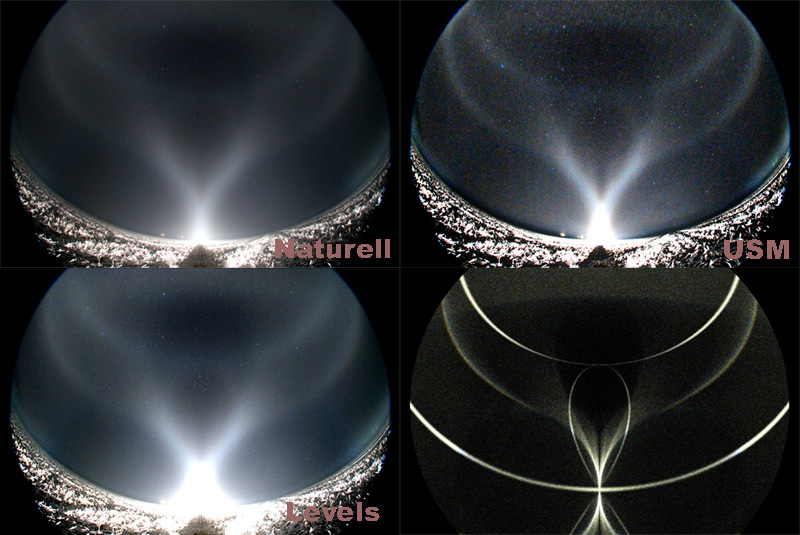 There are several interesting features in the photos (blue spot, the "dark loop" on top of diffuse arcs etc.). On the attached photo there is a rough draft simulation illustrating the different intensity effects. Obviously fine tuning has to be done. More photos and some text can be found here. A more detailed description will follow after I have had time to concentrate on the photos and simulations. This is a historical display. There's so much to investigate that it boggles the mind. Congrats on capturing this! Jukka, I have been waiting for these photos. Marko R. told me the other day you had captured something "out of this world". He was right. I'm sure there will be a lot of talk about this display. Congratulations! This is not a display, Jukka. This high reolution simulation, a freaking halo anatomy chart. If created in the semetary, dead halo observers will rise from their graves. You certainly set the new standards for the lamp displays. Here may not be any new halos, just known ones enhanced to the extreme, but yeah - the fun has only just started. New standards or not, but when the conditions are right one can have an enjoyable experience and with a little luck maybe progress our knowledge of halos a bit. There is a strange combination of horror and excitement in my guts when I think the time someone will be within a dense cloud of Parry oriented crystals or pyramidal crystals. Then all hell is going to break loose. And part of this scenario has already materialized this winter when Marko captured the new Parry-originated halo few weeks back in R-niemi. Right, the Parry display two weeks back was just a foreplay. One of these days somebody is bound to get a bunch of new halos in one display. There has never been really a race for finding new halos because we could nothing else but wait for that special display which possibly occurs within, say, next 20 years. Now it is different - the race is on. I almost forgot, Not only do I see the blue spot on parhelic circle but the diffuse arcs show a oastel blue also.